Pig Trophies made from resin. This attractive Pig Trophy is perfect for any BBQ contest or someone or something that is a real "oinker". Available in a 4" or 6" tall size with an option to add a large wood base. Large wood base measures 5.5" x 5.5" x 4.25". 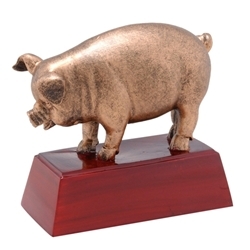 This is the best looking pig trophy I've found - for those that actually want something more professional in appearance sitting on their desk, this is the way to go.